The World Traveling Trunk Project was officially launched in June 2018 during Immigrant Heritage Month, when “Every voice is unique, Every story is powerful.” Since then, librarians across the Free Library have participated in this multicultural pilot program promoting diversity and embracing inclusion throughout this culturally-themed, ready-to-go program in a box. 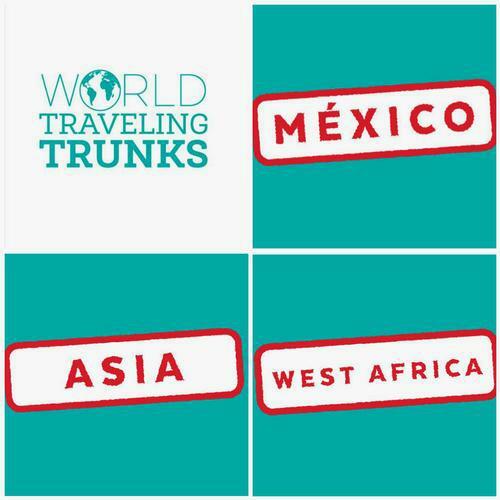 In only four months, the Asia Pacific, Mexico, and West Africa World Traveling Trunks were used twenty-seven times engaging 222 customers. These programs promoted cultural awareness, collective unity, and group social engagement. Hosting librarians provided a unique and safe cross-cultural experience for children and their families. 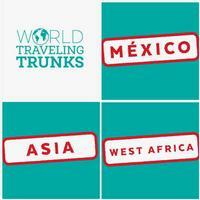 What librarians are buzzing about the World Traveling Trunks? "We have a diverse population at Lovett, and the parents in particular appreciate the diversity and traditional stories. There were a few older Asian children who were also excited to hear about traditional stories [and] celebrations from their culture. I used mine for storytime and toddler-ages, but this could be a great LEAP [Literacy Enrichment Afterschool Program]... as well." – Dana Giusti, Children’s Librarian, Lovett Memorial Library. “Cinco de Mayo was a blast. With Celebremos El día de los niños/El día de los libros that Monday and Cinco de Mayo that Saturday, it was perfect timing. I could not play any of the games and I mistook the w[h]isk [molinillo] for a musical instrument, but the kids loved it. I have one little girl that has her heart set on her next Passport stamp already!" – Molly Vandenheuvel, Children’s Librarian, Andorra Library. “Played Coco CD and explained "recuerda me"; talked about piñatas and how maracas are used; used language cards; read La Familia Calaca and explained El Día de los Muertos and read Lucía Luchadora; children posed with phot[o] props.” – Marianne Bucci, Department Head, Northeast Regional Library Children’s Department. "We read stories, sang songs, the children adored sitting on the colorful blanket, playing with foam puzzle pieces handling the pi[ñ]atas, and the big colorful maracas. I decorated the room with the banner of colorful lace squares on a string. Our community is very diverse. The childcare groups (2 attended) were thrilled with the multicultural storytime as it became educational and entertainment." – Margaret Bernardi, Children’s Librarian, Independence Library. “I Read three stories from the trunk, and we had free play with the toys and all the instrument afterwards. I had a pile of books from the trunk available for parents to read with their children as well.” – Dana Giusti, Children’s Librarian, Lovett Memorial Library. 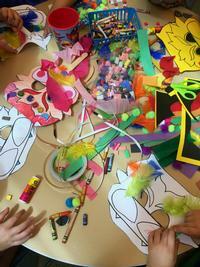 “Special storytime using books, puppets and instruments. We went on a LION hunt. I put additional books for the parents to read, let the kids play with giraffe puzzle and encouraged them to look at the map and try the Cacao Beans.” – Tuesday Chalmers, Children’s Librarian, Lillian Marrero Library. What are the responses from the community about this project? “There was a lot of positive feedback from the parents. 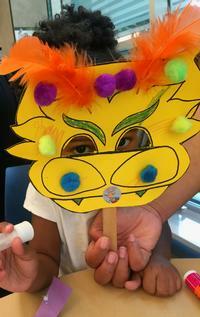 The West African Storytime attracted some new families.” – Molly Vandenheuvel, Children’s Librarian, Andorra Library. “It was fun and my regulars said it was one of the best storytimes. We were loud and got the attention of other[s] in the branch. One teacher approached to me and said she was impressed with the traveling trunk. [The] World Trunks allow the kids to experience other cultures and create tolerance for others.” – Tuesday Chalmers, Children’s Librarian, Lillian Marrero Library. “I hope this trunk will make children especially see that we are all citizens of the world with much to celebrate.” – Marianne Banbor, Library Supervisor, Independence Library. Overall, the librarians are using the resources that are being provided in the trunks and thinking creatively on how to provide a bicultural experience for children and their families. Mostly, in this pilot stage, the trunks have been used in storytimes. During this month of October, the trunks will be traveling to Logan Library, McPherson Square Library, Queen Memorial Library, and Joseph E. Coleman Northwest Regional Library. Please reach out to the staff, at these locations, for detail information about this bicultural program experience. This pilot program is being sponsored by the Friends of the Independence Library and the Strategic Initiatives Department of the Free Library of Philadelphia.